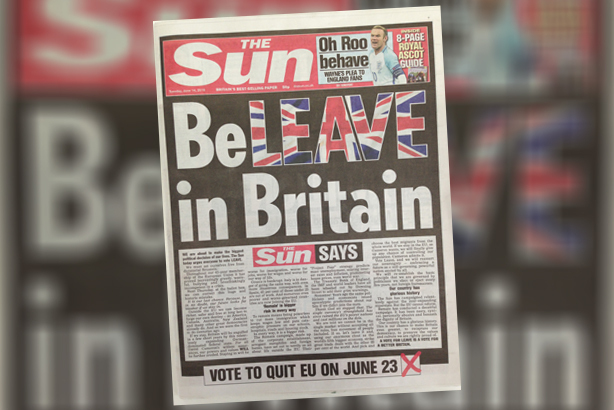 Today's front page of The Sun, which urges readers to 'Be-Leave in Britain' by voting for the country to quit the EU, is an "opening statement" from the UK's most-read newspaper, according to its head of PR. Dylan Sharpe - who asked for it to be made clear that he was speaking on behalf of the newspaper rather than giving his personal view - told PRWeek this morning: "Today is just the opening statement; it was decided that this issue was just too complex to do everything in one single paper." The newspaper has previously been seen by many as pro-EU, but has now come out officially as pushing for a Leave vote in a front-page leader. The article claims that, unless the UK leaves the EU, it will "be engulfed in a few short years by this relentlessly expanding German-dominated federal state". It also criticises the 'project fear' strategy of the Remain campaign, saying it is "nonsense". "The Sun has campaigned relentlessly against the ever-expanding superstate," it goes on to say, before concluding: "A vote for leave is a vote for a better Britain." The Sun has a policy of not giving a byline to or naming its leader writer on the grounds that leaders are considered to represent "the voice of the paper". In addition to the front page, there are two double-page spreads on the EU referendum featuring a number of voices from the Leave campaigns - but the paper also devotes a similar amount of space to Sunday's shootings in Orlando, as Sharpe points out. The Sun's PR man said the newspaper will produce further editorial on particular aspects of the debate over the next nine days, covering immigration, the economy and sovereignty, although Sharpe said he could not say which particular issue would feature tomorrow. Sharpe said that the paper had been "toying with the issue" of when, how and whether to make such a statement for months, and that the decision was reached on the back of editorial views, reader polls and focus groups. On the reason why today was chosen, Sharpe said: "As at all newspapers, you can never really plan more than 24 hours in advance because another news story could break." Asked by PRWeek the extent to which the front page reflected the views of its owner, Rupert Murdoch, Sharpe replied: "The Sun is written for its readers, who we have to convince to part with their hard-earned cash to read us. The editor knows that, the proprietor knows that and we wouldn’t do anything that we thought readers wouldn’t like - that's how we sell the most of any paper in the country." Asked why The Sun had included a teaser for its sports coverage in the top-right of the front page today, rather than a potentially more striking Brexit-only cover, Sharpe suggested this was "a nod to the people who might be turned off by politics". Sharpe, who told PRWeek his morning had been particularly busy with a number of media requests, joined The Sun in March 2014 from Business for Britain, an organisation campaigning on behalf of businesses for a renegotiation of the UK's EU membership, having previously worked for consultancies such as Pagefield, and for former London mayor, the prominent pro-Leave MP Boris Johnson.